There are few Assamese Newspapers available in Assam State & in India and Asmomiya Pratidin is one of them. Popular Assamese daily newspaper Asmomiya Pratidin is an Assamese language (regional language) newspaper and may be this is the reason why Asmomiya Pratidin gets its popularity most. Asmomiya Pratidin Assamese Newspaper regularly published from four different publication centres in Assam and those Asmomiya Pratidin Publication Centres are located at Guwahati, Dibrugarh, Bongaigaon and North Lakhimpur in Assam. Asmomiya Pratidin is the most popular Assamese Newspaper that has a reader base around 3-lakhs (daily). • Chief Editor Name of Asmomiya Pratidin Assamese Newspaper - Haidar Hussain. • Read Asomiya Pratidin e-Paper Online at www.asomiyapratidin.co.in. Publisher of Asmomiya Pratidin Newspaper Jatin Choudhuri has introduced the e-Paper Asmomiya Pratidin Online version to increase the reader base on Internet like other Newspaper companies. People can read Asmomiya Pratidin Newspaper Online at www.asomiyapratidin.co.in website. Search Tags: Asmomiya Pratidin Assamese Newspaper Online, Guwahati Assam Office Address Phone number of Asmomiya Pratidin Assamese Newspaper Office, e-Newspaper online version of Asmomiya Pratidin Assamese Newspaper details about jobs. Assamese daily newspaper Amar Asom is the most popular Assamese Newspaper that publishes detailed news about Assam State, Sports, Entertainment and thought provoking articles in editorial page of Amar Asom. Another reason behind the popularity of Amar Asom Assamese Newspaper is the special column where the successful Assamese people share their articles to the world through Amar Asom Daily Newspaper of Assam. Retired President of Assam Sahitya Sabha Dr. Homen Borgohain, Assamese journalist author, is the Chief Editor of Amar Asom news paper of Assam. In this era of Internet, Amar Asom Assamese Newspaper has started Amar Asom ePaper as well on Internet to reach the Assamese people who are outside Assam or in Foreign. 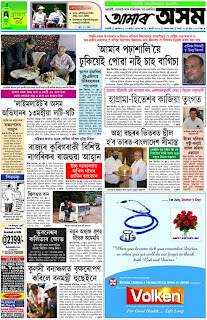 The e-Newspaper Amar Asom can be read online through the official website of Amar Asom. All you need to do to read Assamese Newspaper Amar Asom Online is to search by ‘Assamese Newspaper Amar Asom Online version’ and you will be redirected to e-Newspaper Amar Asom. To reach & to distribute throughout Assam State & in India, Amar Asom Publication Limited has established two publication centres in Assam to publish Amar Asom Newspaper daily. 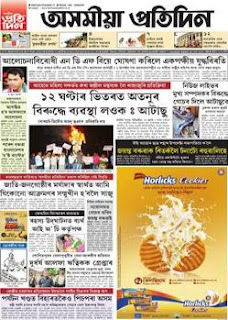 Guwahati and Jorhat is the place where Amar Asom Newspapers get printed daily. • Amar Asom Daily Newspaper written (printed & published) in Assamese (Regional) Language. • Assamese Newspaper Amar Asom Daily Price Cost is only Rs.5/-. (as on 2011). • Chief Editor Name of Amar Asom Assamese Newspaper is Homen Borgohain. • Executive Editor Name of Amar Asom Assamese Daily Newspaper is Prasanta Rajguru, who is a retired Educator & Writer. • Amar Asom Newspaper was printed & published by G.L Publications in Assam. • Address of Amar Asom Newspaper Guwahati Office – Those who want to publish their news; should contact Amar Asom Guwahati Office that is located at G.L Publications Ltd, Ulubari, G.S Road. Guwahati- 7, Assam. • People may send their news queries information to Amar Asom Newspaper Office by Email at aamar.asom@gmail.com / glpghy2009@hotmail.com. Search Tags: Assamese Newspaper Amar Asom online version, office address phone number contact details of Amar Asom Assamese Newspaper.